Off Wellman Way: The Chicks Dig It. I've missed our chickens and my bestest friend will be so happy I'm back in the chicken business. I worry that we will have a rooster. Actually, I sort of okayed the whole chicken thing, but the project is my son-in-law's, Dave Knapp (married to my 5th child, Larin) We love knowing that our eggs we eat are safe. Maybe we won't have to color them for Easter. Not the chicks, the eggs. hmmmm. Not sure if they'll lay this next summer. Wouldn't they be pullets? Actually the whole sound of the chickens and having them is completely what I love. Jeanie, I may just have to not eat chicken, anymore. One of the chicks has only one wing. 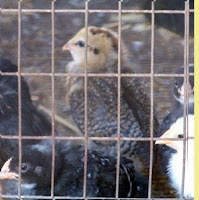 Corbin, one of my grandsons, adopted that one and I'm praying for him not to be a rooster. Where did that chick's wing go? So many unanswered questions, but really of no consequence, because it doesn't matter. Actually, it has made a little chick more loved and special to all of us. 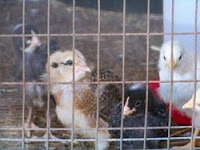 The chicks are mixed breeds, I think..... duhr...they are all different colors and some have fluffy legs. We got a picture of the Chicken Coop. My friend, Jeanie actually painted it so cute with the barn-red antiquing and decorations. lol The coop used to be a crawler-tractor shed and and a couple of stalls, and it's been there since 1929, I quess an antique, already. I love chickens. I want more chicks, baby chicks in the fall.